The dresses below are one-offs, but they can be remade in similar or other fabrics. Please contact me if you are interested in a custom-made dress. This dress is made of blue cotton and a broad lace sewn onto to both bodice and skirt. I made this midnight blue wrap skirt using a bi-stretch polyester which drapes beautifully. The waistband ties in the front. Black cotton dress with a bustier-bodice. A personal favorite: This bustier dress is made of pink satin and black tulle with velvet dots. New Years Eve dress made of blue cotton with starry print. This dress is made of blue cotton with floral print and is fully lined with blue soft voile. The dress has pockets on both sides. The gathered skirt is 45 cm long. I made the tulle petticoat separately from the dress and it is 50 cm long. This dress is made of cotton with a pretty print resembling tiny branches. The bodice is lined with bright green soft voile. This turquoise 50's inspired dress has a lined bodice and a broad turquoise lace which I hand sewed to the bust and the skirt. The dress is made of broderie anglaise and has a detachable lace belt positioned at the waist. The dress is fully lined and features a puffy knee-length gathered skirt. 50's inspired halter-neck dress made in purple cotton. Christmas dress made of red cotton with poinsettia print. This dress is made of red cotton with rose print. The entire dress is lined with dark red satin. 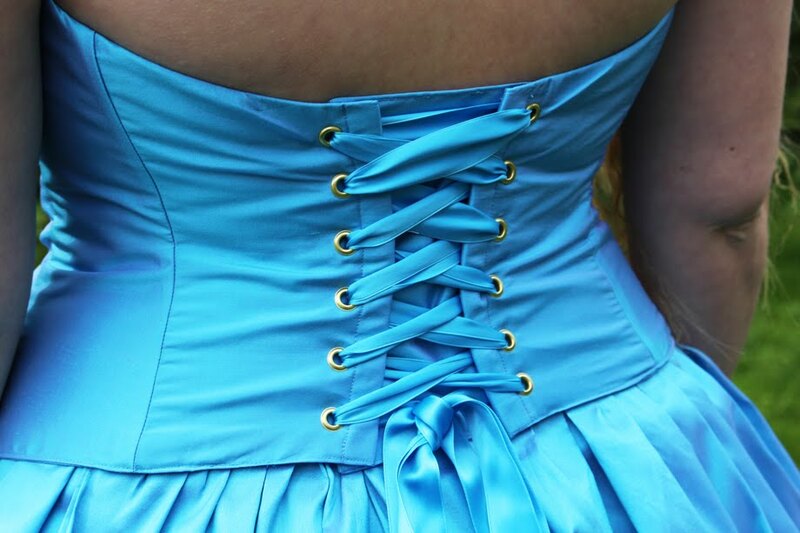 The bodice features a corselette that is hand sewn to the neckline. This dress includes a matching drawstring bag. This black sweetheart dress has a lined bodice. I have added two bows positioned at the waist. They are made of the same cotton as the dress. For my 25th birthday I sewed a corsage and skirt of Thai silk, I had bought on my honeymoon. Colourful halterneck dress with gathered skirt and open back. This dress has a sweetheart neckline and cross-over straps on the back. I fully lined the dress with pink soft voile and I have used French seams for the vertical seams. Spring outfit containing an unlined jacket and frill-skirt made from Thai silk (green on one side and golden on the other). I made this cut-out bust-line dress using a Burdastyle pattern. This blue cotton dress has white lining and features a full circle skirt.